Welcome to The Emergency Room. Please have a seat. 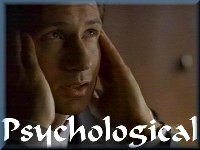 Here you will find all your Mulder Torture needs, sorted by type of physical or psychological condition. Click on the images below to enter the main page for each MT category. Be aware that some of these stories are old so the email addies on them may no longer work. If you find anything wrong with the links or pages in your travels, please email and let me know. This site was originally owned by Shirley Smiley as part of the old Mulder Torture Anonymous fanfic site. It has been retitled and rebuilt using the same backgrounds and images, with all due respect and appreciation for Shirley's stewardship. Stories marked as have been added with the most recent update.